African Ruby Bracelet (Size 7 and 1.5 Inch Extender) in Sterling Silver 3.69 Ct, Silver wt 10.74 Gms. One Time Close Out Deal - African Ruby (Very Rare Size Ovl 12x10 mm), Cubic Zircon Cuff Bracelet (Size 7.5) in Rhodium Overlay Sterling Silver 8.200 Ct, Silver wt 14.97 Gms. African Ruby (Ovl 7x5 mm) Bracelet (Size 7.5) in Rhodium Overlay Sterling Silver 15.650 Ct.
LucyQ - Open Drip Collection - African Ruby (Rnd) Rhodium and Gold Overlay Sterling Silver Bracelet (Size 7.5) 1.940 Ct, Silver wt 11.46 Gms. The deep red enticing colour of Ruby is a sight to behold. This gemstone belongs to the most valuable variety of the corundum mineral species. Ruby is widely called as the "King of Gems” and when fashioned with precious metals like silver, gold or platinum the final result is no less than a masterpiece. The glare, hues and opulence it garners call for a jewel to be embraced for life. TJC wears the hats of curating some fine pieces in ruby bracelets for its esteemed clients in the UK. Every piece so designed and then went into craftsmanship has elements of skill artwork and contemporary designs. Ruby is the birthstone of July and is among the top four most expensive and valuable stones along with emerald, sapphire and diamond. Dates back to around 2000 years, this stone was found highly as the jewellery of kings and queens and hold its glory since then. A gorgeous gemstone possessing some stimulating and healing properties, the jewellery so formed in this stone welcomes fortune and wealth. At TJC, this mystical gemstone is handpicked from across the globe to finally produce some awe-inspiring ruby bracelets. It's not only about a ruby bracelet even the concoction of ruby diamond bracelet also gathers some sharp interest of the buyers in the UK. The beautiful enclosing of brilliant red in the finely fabricated diamond and ruby jewellery sets as one most admired accessory for the women. Bracelets are love and come along as a dazzling gift to entice your love on some special occasions. 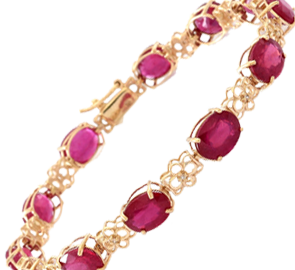 So, take your love for ruby and diamond bracelet to next level with a gorgeous assemblage of rich ruby bracelets from TJC making waves across the globe for hands-on craftsmanship and excellence in selecting the finest of the gemstone. Here you have the glare to surrender your senses. Make way for designs that have already made a mark on your head! !